What's New @ Roselle Public Library: What's Up with Kids! this Fall? What's Up with Kids! this Fall? The Fall issue of "What's Up With Kids!" is now available online. "What's Up With Kids!" 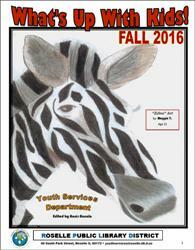 is a publication of the Youth Services Department, written by kids, for kids. The "What's Up With Kids!" editors are always looking for book reviewers, artists and reporters. If you're in grades 2 - 6 and you'd like to see your work in print and online, contact Mrs. A or call the Youth Services Department, 630-529-1641 x*351. The next organizational meeting of "What's Up With Kids!" is Thursday, October 13, 6:30 p.m., in the Youth Services Storytime Room. No experience necessary. No registration is necessary. Just be there!